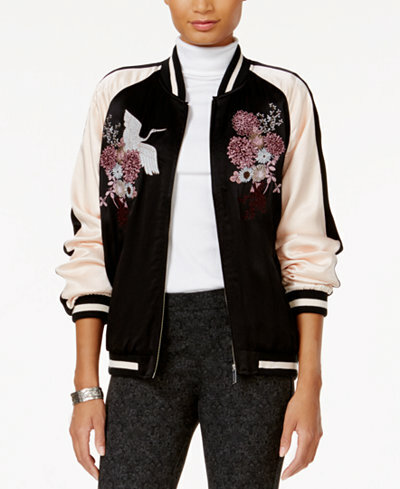 Petite Impact: Top 14 Bomber Jackets! 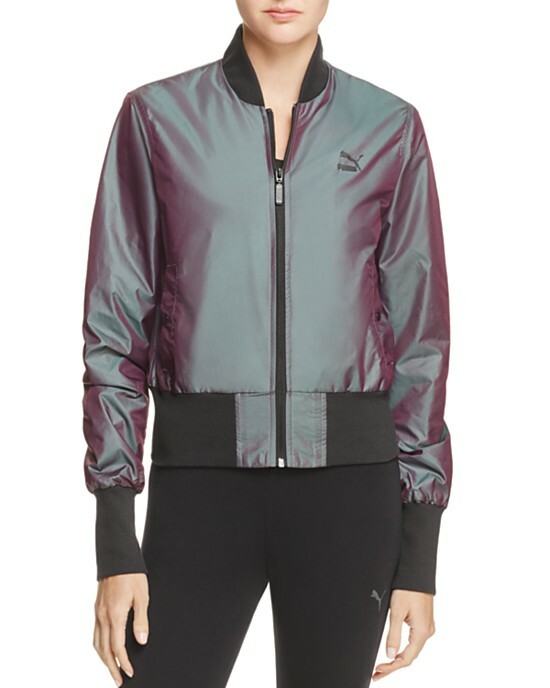 Ever since Lululemon released their Non Stop Bomber Jacket, I've been obsessed with finding the perfect one. I wanted to see what other options there were from other brands before I pulled the trigger. I literally spent a whole day looking at hundreds of different bomber jackets. This is my curated list of bomber jackets narrowed down to my top fourteen. Now before I start, here is a little bit of information about the bomber jacket. These jackets were originally worn by military pilots. Back in World War I the pilots needed something to keep them warm while flying, since airplanes back then were not yet enclosed. Remember that? Eventually, it became popular to wear as everyday apparel. I know that a bomber jacket is a trend. How do I know this? Because I wore one when I was in high school except we called them flight jackets. Mine was black and silky with an orange lining. I pretty much wore it to death. So, given that this is a trendy jacket I don't know if I would want to spend too much money on it. My budget on a bomber jacket is around $100. I would prefer to spend less, but I would also spend a little more if there was something very unique about the bomber jacket. 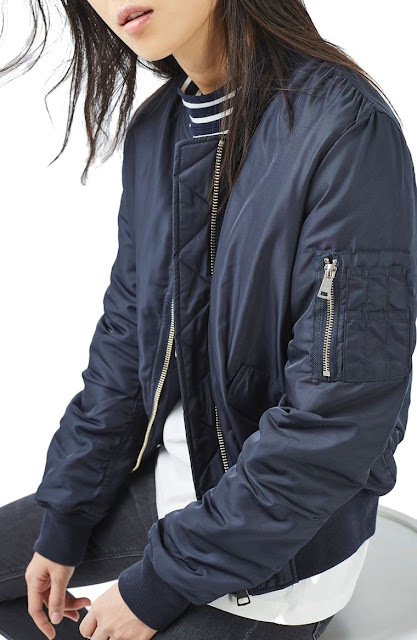 There are quite a few different kinds of bomber jackets. I'm going to list my top 14 in four different categories. The categories are: the quilted bomber jacket, varsity embroidery bomber jacket, flight bomber jacket and plain bomber jacket with no frills. Let's start with the plain bomber jacket with no frills. I picked four that range from $47.40 to $90. Very budget friendly pieces. As you can see these are very plain with no embellishments at all except for the two side pockets. I'm a sucker for anything iridescent so while this one falls under the plain no frills category, the iridescent color is something that will make this one stand out from the rest. For the price, this one is very simple and will probably outlast the trend. You can throw this jacket over anything. 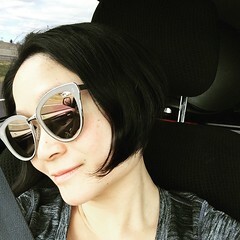 If you don't want to spend a lot of money on a trendy item, for under $50 this one is very affordable if you just want the look. Even though this is a varsity bomber jacket I am putting this under the no frills category. I liked this one for the color, although it may be too pink for my tastes. It's still pretty cute though! Next category is the flight jacket. This is the kind I wore when I was in high school and about half a lifetime ago. I am old. The flight jacket is just another name for the bomber jacket but since the next three I picked all have a pocket on the left sleeve, it's just easier for me to categorize it this way. Just a little trivia for you, the pocket was meant to hold pens for the pilots. 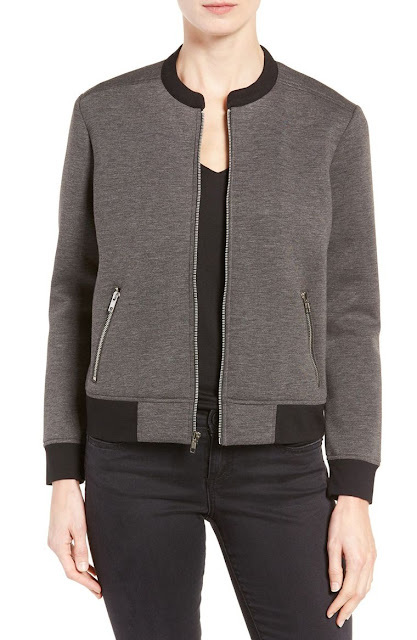 Halogen Flight Bomber Jacket $79 also comes in petite! I think this one is really cute and I'm extra excited because it comes in petite sizing. And for $79? I'm willing to give this one a try. I'll see if this is still available when my ban is over. I picked this one because I liked the blue. So far most of the bomber jackets are dark colored and mainly black. The blue is a nice change. The inside is also leopard lined which will keep you a little warmer than the others I've listed so far. This one reminds me a lot like the one I had in high school. So far all three in this category are under $100! 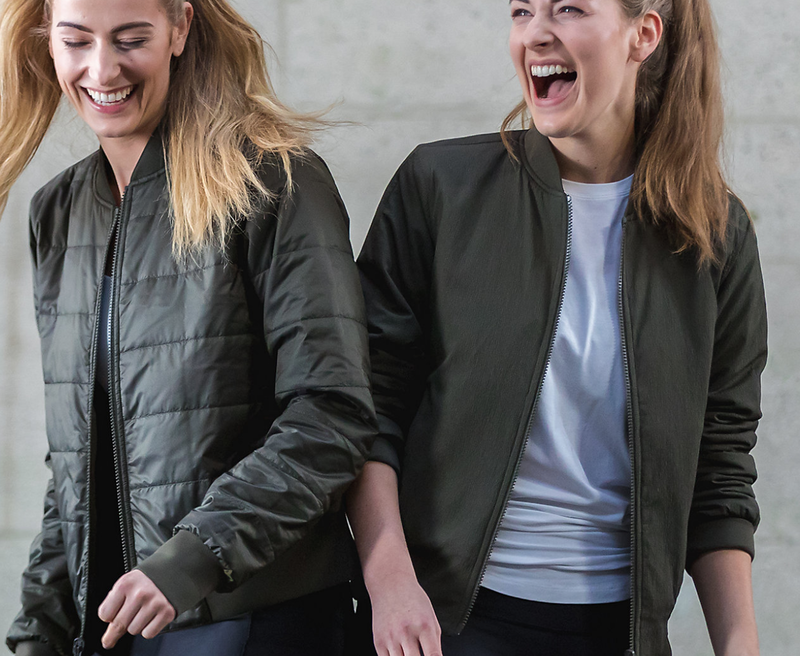 Next category is the quilted bomber jacket which is where the Lululemon's NonStop Bomber falls into. What's nice about the Lululemon version is that its reversible. It's like getting two jackets in one. I definitely prefer the dark chrome color out of the three. It's also the most expensive so far. This one reminds me of the dark chrome color. It's also lined with down feathers and Primaloft so this will actually keep you quite warm. For under $50 this one looks fantastic. It also has great reviews. 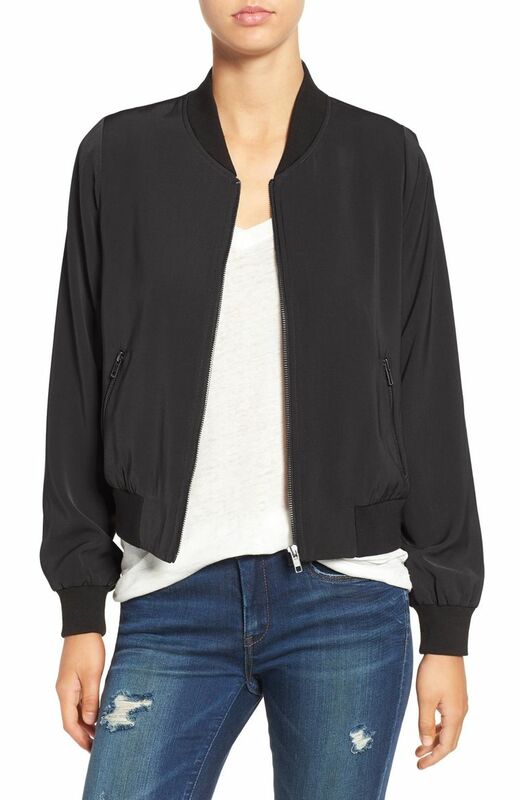 It is slim fitting which is great because I find most of these bombers to look a bit boxy and shapeless. The look of this particular one is the most reminiscent of the old style bomber jackets. The last category is my favorite. Varsity embroidered bomber jackets?! These are also going to be more expensive because of the embroidery. 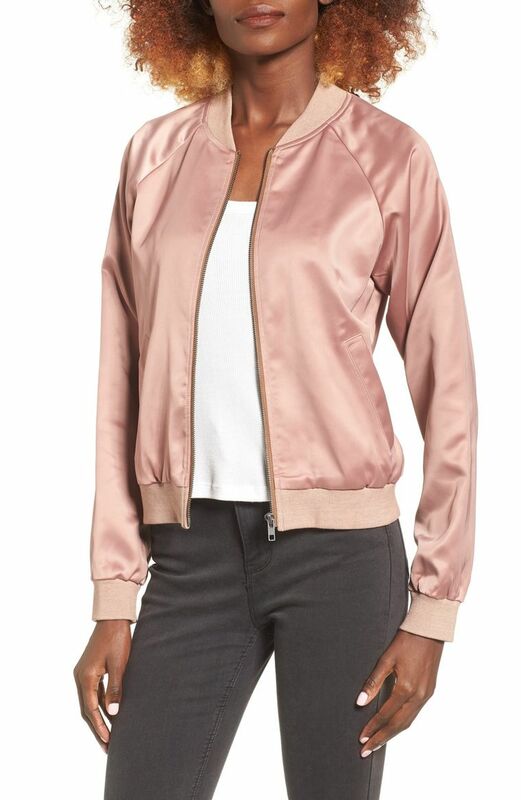 The last four jackets I picked range from $94.99 to $149. I think the embroidery on this one is quite pretty. This is the only one out of the four jackets in this category that you can machine wash. The others are hand wash only. This one is the most expensive in my list because the embroidery is just extraordinary! You need to check out the close up photo of the birds. I think it's definitely worth the money. Of course Anthropologie would show up on my favorites list. I particularly like the dark burgundy trim along the hem of the jacket. There's also a little bit of red along the leaves. I think this bomber is very elegant and sporty at the same time. The last one on my list is also by Elevenses and may be a little over the top because of the velvet material. It's definitely a very unique piece. It's also nearly half off! 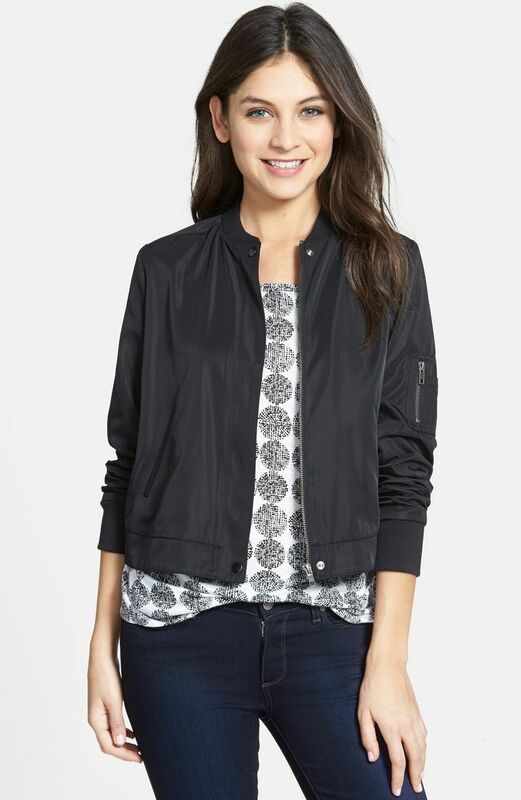 To wrap up this post, my favorite bomber jacket for under $50 goes to French Connection Quilted Bomber Jacket. 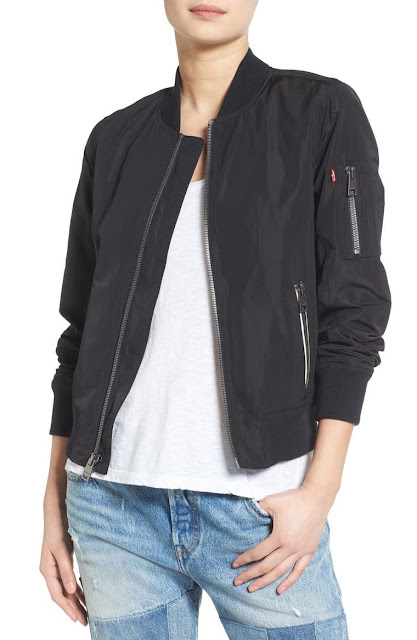 My favorite for under $100 goes to Halogen Flight Bomber Jacket. 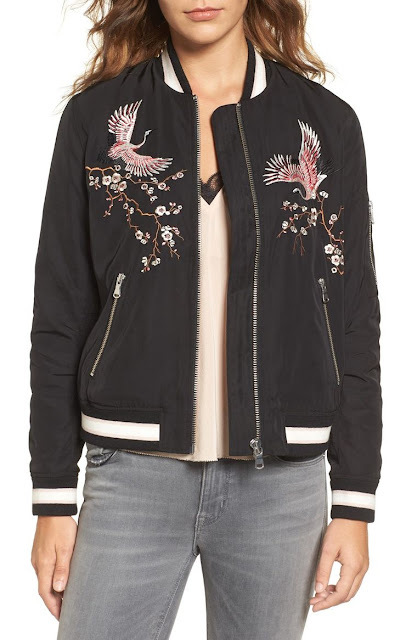 And if money were no object I would totally buy Elevenses Solstice Bomber $148. What do you think of bomber jackets? Love em or hate em, they are pretty popular right now. Do you have a bomber jacket? If you do, I would love to know which one! Here are some others that didn't quite make my list but are worth taking a look at. Great picks! But what, Lulu Bomber did not make the top three? It is pricer but the dark chrome is gorgeous! My tts size 4 was a bit roomy so I ordered size 2 to compare. It is supposed to come tomorrow. Have you tried it in a store? I'm debating on getting a bomber jacket once my ban is over. I'll see if I'm still itching to get one in 2 weeks! That one looks a little too poofy for me. But I do like how satiny it looks. I feel like bomber jackets have been around forever. Nothing new. ZARA has been having them on their racks for at least 5 seasons, they keep updating them. I don't find anything special about the Lulu one. All of your other picks are nicer and have additional touches.